These fish cakes are a great way of using up leftover mashed potatoes, get the kids to help with the cooking and they may never ask for fish fingers again. Preheat the oven to 200C/180C/Gas 6. Take the cream cheese out of the fridge and put to one side so that it reaches room temperature. Peel the potatoes and then chop them in to pieces that are all the same size. Bring a saucepan of water to the boil and add the potatoes, boil until tender then drain. Tip back in to the saucepan and leave off the heat to steam dry for 5 minutes. Once dry, roughly mash the potatoes until completely broken up but not completely smooth. Leave to cool. Drain the tins of fish and add the contents to the mashed potatoes along with the dried herbs and cream cheese. Season with salt and pepper. To make the fries, slice the sweet potatoes into chip shapes about 1cm/½in thick and as long as the sweet potato is long. Put in a bowl and toss with 1 tablespoon of oil. 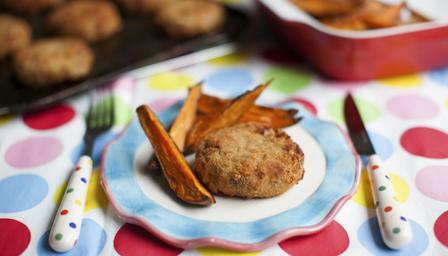 Put the sweet potato fries on a baking tray and bake for 10 minutes while you prepare the fishcakes. Put the rice cereal into a freezer bag and scrunch it up to make breadcrumb-sized pieces. You might find it easiest to use a rolling pin to roll over the bag, breaking up the cereal inside. Put the egg into a shallow bowl and beat. Add the flour to a separate shallow bowl and the broken up rice cereal to one more shallow bowl. Take the fish cakes out of the fridge and dip them, one by one, into the flour, shake off any excess then dip into the egg, making sure all the sides are coated. Finally dip into the crushed cereal, pressing the cereal crumbs against the fish cakes and making sure all sides are completely covered. Grease the bottom of a baking tray with a little oil and put the fish cakes on the tray. Gently turn them in the oil so that both sides are coated. Put the tray of fishcakes in the oven after the fries have been in there for 10 minutes. Bake them all together for 10 more minutes then carefully turn the fishcakes and fries over. Bake for a final 10 minutes or until the fishcakes are crisp, golden-brown and hot all the way through. Serve the fishcakes warm with the sweet potato fries on the side.